You can find one of the most unique wildlife encounters in Hudson Bay, Canada. In the late summer and fall, the bears walk up and down the coastline as they wait for the ice to form on the bay so they can hunt seals. When staying at one of Churchill Wild’s eco-lodges in the heart of polar bear country, you can catch a glimpse of polar bears playing with their cubs, taking a nap, or rolling around on the beach. With the safety of your guide’s company, you can even stand 30 feet from a polar bear! A tiger safari is a must on our list! Bandhavgarh National Park in central India has the highest density of tigers in the country, making it a popular spot for tiger safaris. With its 12 villas built in the local style, expert guides, and delicious food, Mahua Kothi is the best place to stay at the national park. Located in the heart of tiger country, you’re sure to catch a glimpse of these beautiful yet endangered big cats. One of West Papua’s major attractions is the world’s largest fish, the whale sharks. These gentle giants can get up to 60 feet in size. Fortunately for those brave enough to snorkel or dive with these magnificent animals, their diet consists of mostly plankton and small fish. 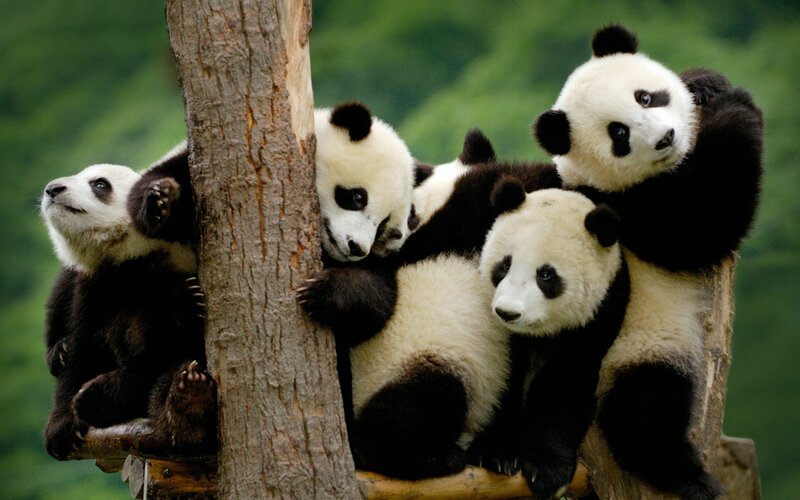 One wildlife encounter you definitely need in your life is with the giant panda bears in China. At the Chengdu Panda Breeding and Research Center, you have the opportunity to hold and hug a baby panda! The proceeds raised from this unique experience go towards vital research to protect these endangered animals. Stay in a beautiful colonial mansion built in the 1930s with just ten elegantly furnished guestrooms. It’s also home to a herd of habituated Rothschild giraffes who like to poke their heads through the windows at all times of day hoping you’ll share your scraps. Guests staying on the second floor will enjoy the experience of opening their windows first thing in the morning to be greeted by giraffes waiting patiently for their oatmeal pellets which the hotel staff leaves scattered around the property. Perhaps one of the most thrilling wildlife encounters on earth is located inside Par National des Volcans, Rwanda where guests of Sabyinyo Silverback Lodge can take a guided trek to find these spectacular animals. It’s so rare to have an intimate encounter with wildlife while on foot and this particular experience is heightened by the fact that we share about 97% of the same DNA with this magnificent creature, making this a chance to commune with a close relative. As the largest living species of tortoise, the Galápagos tortoise is definitely a wildlife encounter you need in your life. These vulnerable animals only exist on two remote archipelagos in the world, including the Galápagos which is named after the native tortoises. When you visit Ecuador, you can really get up close and personal with these gentle creatures. If you want a unique wildlife experience, you have to visit Jack’s Camp, in the Kalahari Desert in Botswana. Here, you can get up close and personal with meerkats thanks to an ongoing habituation program. Make a new friend and enjoy the gorgeous scenery the Kalahari Desert has to offer. The island of Tierra del Fuego hangs like a pendulum from the southern tip of Argentine Patagonia - it’s only 625 miles across the Drake Passage to Antarctica. In the summer, you can also visit a nearby island populated with 16,000 penguins! Stay at the convenient Arakur in Ushuaia to visit these dapper birds and check out the bottom of the world. 10. A classic safari PLUS baby leopards! When in doubt, you can always take a classic safari, which never disappoints. Check out the Big Five (lions, elephants, buffalos, leopards, and rhinos) in their natural habitat. These gorgeous creatures are definitely a must-see, especially if you’ve never done a safari before. This is a great way to be introduced to the exciting wonders that the African safari has to offer.